I leave HK in a little over two weeks, so I will be posting a few reflective and “good-bye” type posts over the next few weeks. In the spirit of starting a new chapter, I want to share some important and practical life tips that I have learned as I prepare to close this particular chapter in my life. Always be prepared. After learning the hard way, I now carry tissue, wet ones, sunglasses, an umbrella, and water with me anytime that I leave the apartment for any significant amount of time. In the summer, I also bring a sweat rag and possibly sunscreen and bug spray. You’ll thank me later. Ladies: learn to use a squatty potty. Many countries do not use the same sort of indoor pumping that we are used to in the US, and some countries prefer the squatty potty to the Western toilet. So to avoid possible situations, be comfortable with a variety of plumbing options. Go on “adventures.” My fellow Mission Intern and I periodically go on “adventures” in Hong Kong and when we travel to other parts of Asia. These “adventures” usually involve us finding a restaurant a friend told us about, or a shop or something without using GPS, OpenRice (HK version of Yelp), etc. I have eaten some of my favorite foods this way and found my favorite restaurants, stores, etc. Do stuff and be in the world. This piece of advice is closely related to #3, but I also try to do things on my days off every so often. I go hiking, go to the beach, wander through the street markets, go to museums, etc. There are plenty of Saturdays that I spend all day watching TV, but I also like to be in the world. Realize that you are not that important or that special. I say this not to be mean or “debbie downer” but most of the time, I am not that important on an individual basis. My specific work is not that important or that special. I am important and special to my community and because I am a part of that community. The work that we do together is important and special because we work for the betterment of the community together. Adapt. I am a creature of habit, and I like routines. I can also be fairly high maintenance about certain things, especially my hair. BUT I started blow-drying my hair here because of the weather. I’ve changed several other habits to enable me to fit into the lifestyle here in HK, and life is still good, even without my routines. So embrace the change. Exercise. I swim and go running regularly in HK. I have also started hiking more recently. Exercise makes you happy. It keeps me sane and focused. I’ve learned neighborhoods and discovered fun stuff (like older Chinese women practicing fan dancing on mornings) by going running. Try new things. My first few months in Hong Kong, I bought a fruit or vegetable from the outdoor market every week that I had no idea what it was. I discovered a few fruits and veggies that I now eat regularly. I also have tried a variety of Filipino, Chinese and Indonesian foods over the past 17 months, some of which I absolutely love. Forget personal space because you don’t need as much of it as you think you do. HK is crowded. There are people everywhere, on the sidewalk, on the trains, etc. I can extend my arms out to the sides and touch both of my kitchen walls in my apartment. This has all become normal to me, and occasionally I miss having more space, but I also don’t mind cleaning a smaller apartment! After you realize that you are not that important or that special, learn to relax, let it go and have fun. Life is a lot more fun when you stop complaining about how awful everything is and focus on what’s amazing and cool in your life. 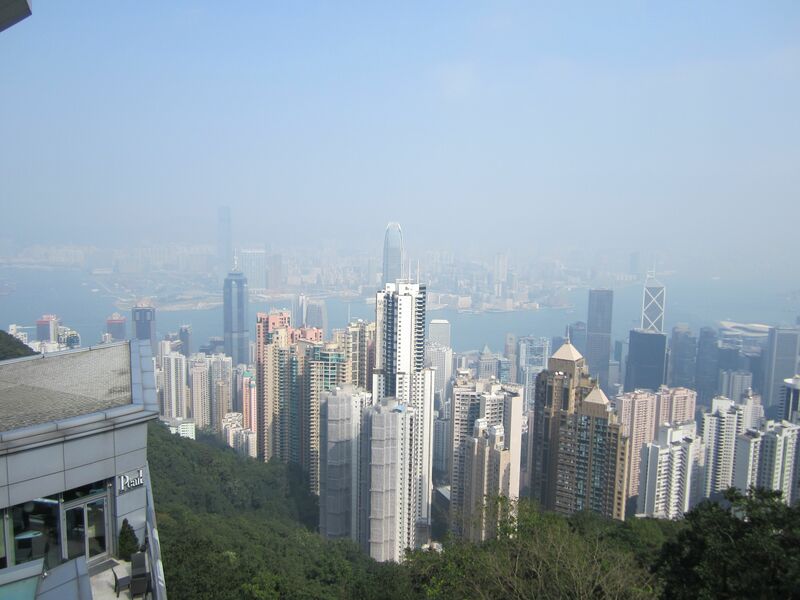 I’ve lived in HK for 17 months, and the view from the view from the Peak (below) or on the bus down to the beach or 116th floor of the Elements building impressed me every single time. This city never ceases to amaze me no matter what else is going on in my life. HK has more skyscrapers than NYC!